Only three days after setting the new Spanish La Liga all-time scoring record, the Barcelona FC forward, Lionel Messi, set the new all-time UEFA Champions League goal scoring record with a hat-trick vs. APOEL. Messi now has 74 goals to his name in the Champions League, which is three more than Raul scored during his time playing in the Europe's most elite competition. It took Messi 91 games to set the new high. Messi didn't just break the record. In his usual fashion, he broke it in style. Messi, who is left footed, hit the net three times with his right foot vs. APOEL on Tuesday night. The Argentine forward at 27 is now the highest ever scorer in the history of Barcelona FC, Spanish La Liga and the Champions League / European Cup. 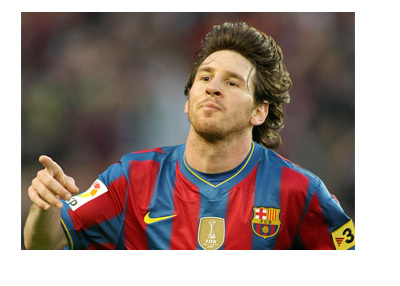 He broke all three records by scoring hat-tricks. The reality is that Lionel Messi and Cristiano Ronaldo could quite possibly go back and forth breaking the all-time UCL goal scoring record for years to come.